These are tough times for Cher Horowitz. Sorry, Villanelle. The show has trained us to think she’s stronger and smarter than almost everyone else, and it’s something of a shock to see her struggle against two different larger, stronger opponents. And while one of those interactions ends with the outcome we expect, the other serves as a reminder that Villanelle has much bigger concerns than whether or not Eve is taking her phone calls. The subplot with Creepy Julian looks pretty similar to a traditional horror movie. But the slowly accruing menace of the household Villanelle finds herself in is an unusual fit for the character. So often, you don’t really believe that anything will actually happen to her. There are very few rooms that she’s not the scariest person in. Leave it to Killing Eve to ask the question, what happens if the main character in your horror movie is also a serial killer? Villanelle herself seems somewhat perplexed by the situation. Here she is, just trying to con a gullible man from the supermarket, and he turns out to be a lot more dangerous than expected. It’s a nasty little twist on how this situation would unfold for an ordinary woman, with Julian showing increasingly paranoid behaviors before lashing out at her and proving he was paying a lot more attention to what was going on with Villanelle than she anticipated. Still, once she tells him he’s going to bleed to death, it’s only a matter of time before she follows through on the promise. 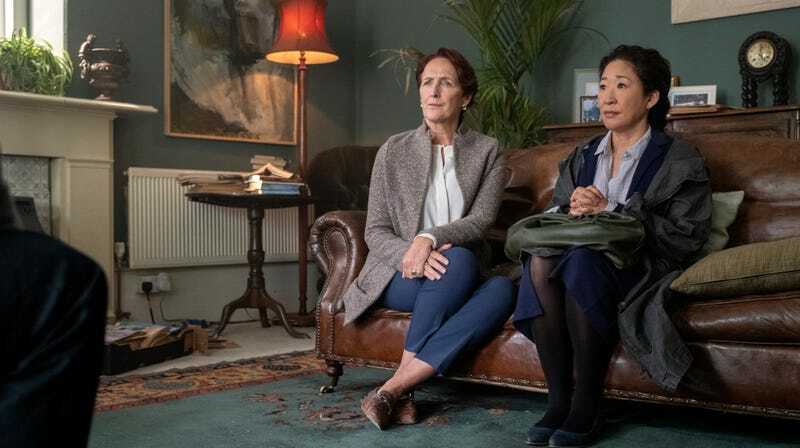 It’s very Killing Eve to have him lash out with some patented Nice Guy language at Villanelle so that the very last thing he hears is her telling him very matter of factly that this is exactly what he gets. A huge part of Villanelle’s character is that she doesn’t operate under any recognizable moral framework, but it’s hard not to see her thinking Julian deserved this one. Eve, meanwhile, is busy making it clear to every single person she interacts with that she’s still completely obsessed with Villanelle. The only thing she does to convince them otherwise is to act very suspicious with Kenny. Is she making the right choice in confiding in him? It’s hard to tell—so far we don’t know a lot about how Kenny feels about his mother. He does seem quite capable of keeping secrets, since he doesn’t tell Eve about Konstantin before his mother reveals that the man is staying at their house. Just a thought, but it’s possible Kenny needs to consider getting his own place. There’s something about costuming him in shorts in that scene that makes him look even younger. On the upside, Eve does demonstrate that she’s actually good at what she’s doing, and not just a complete Villanelle fangirl. She comes up with a pretty apt profile of their new killer. And did everyone catch the linked ghost references? Eve and her team call the new killer the Ghost, Eve points out that Villanelle is going to hate her, and earlier in the episode, Villanelle tells Creepy Julian that she hates ghosts. Their styles, as Eve points out, are very, very different. Villanelle has no desire to maintain a low profile, while the Ghost is going to stay hidden a lot longer thanks to her no-frills style. The real question is whether or not they have the same employer, which has now not-so-kindly welcomed Villanelle back into the fold. Her new handler certainly lacks the charm of Konstantin. It all adds up to the suggestion that we’re going to see a very different Villanelle this season. She’s weak, disadvantaged, unprepared for the threats she’s facing. The timing of her escape from Julian’s house also suggests the possibility of a very different outcome if Eve had managed to arrive just a few minutes earlier. Is Eve going to have to rescue Villanelle sometime this season? Nothing will ever beat “sorry, baby,” but it’s always a neat twist when these two leave each other creepy messages. I do wish they could have clued us in some other way than having Eve literally Google “apple, eve.” What in the world did she think she’d get? And why did she get cool art and when I did it I got apple juice ads? The power structure on this show is often resolutely female, between Eve, Villanelle, and Carolyn, but this episode seemed very determined to remind us that men are still a danger to these women. So, Emerald Fennell is a big Clueless fan, huh? Has anyone ever wanted a “hottie bottie”? I kind of loved that Julian’s mother escaped at the end. That was some pretty weak writing for explaining Elena’s absence, given that in season 1 she seems to be quite close with Eve and is hooking up with Kenny. Eve barely even reacts! So which of that rich guy’s two kids ordered his killing? The end of the episode is shot as a cliffhanger, but did anyone think Konstantin was dead?